Reiner’s 16mm toy projector, with can of Ozaphan film. It begins in 1975 in Germany. I was in my late teens when I set out to upgrade my film hobby from S8 film to 16mm; clearly not fully appreciating the equipment – and production costs – of that gauge. As a result of my budget restraints I browsed the outlets of used film equipment mongers and eventually bought a wind-up Bolex camera and Bauer Selecton II projector, both dated from the 1950s. It was on one of these visits that I also spotted a 16mm hand-cranked toy projector and a few orange 16mm film cans, containing films on dark blue metal spools. Needless to mention that I bought the lot. The brand names on the cans – Ozaphan and Kalle – were news to me, but Agfa was a household name in our family that, according to my father’s teaching, assured quality. What could go wrong then…? I planned a film show for the weekend and seriously hoped to entertain my friends with Hindenburg’s funeral procession (1934), Rumpelstiltskin Part 4 (Grimm 1812), an almost complete fragment of Snow White (Once Upon A Time) and, as I know now, Blue Bottles (1928). By the way, the latter film is British-made as one of three comedies by H.G. Wells, starring Elsa Lanchester, who later went on to become the Bride of Frankenstein. “Blue Bottles” (1928), showing Elsa Lanchester. All films are silent with intertitles in German language. First attempts to show the films to myself ended rather abruptly with torn perforation and many broken frames. Sigh! Eventually, in 1984, I moved to New Zealand, storing my film gear for thirty years in my parents’ basement, only to re-discover my former treasures on last year’s visit to the Vaterland. By now I had worked thirty-plus years in the film industry, including a recent stint in film archiving, which kindled my appreciation for old films, and, with the help of the Internet, I was able to learn more about Ozaphan Sicherheitsfilm (safety film). The company Kalle & Co was founded in 1863 by Dr. Wilhelm Kalle in Biebrich – Wiesbaden, Germany. From humble beginnings and rented premises the firm manufactured tar-based paints at first. After 1885 they expanded into pharmaceuticals, developing brands such as Jodol (wound disinfectant), Tylose (gum paste for confectionary), Supronyl (sheet foils for packaging), Nalo (non edible but seamless Cellophane sausage skins), Cellophane (for meat packaging and more) and Ozaphan motion picture film, just to mention a few. What an incredible product range! Cellophane, invented 1905 by Swiss chemist Dr. Jaques Edwin Brandenberger, is made from cellulose or, as the experts call it, regenerated cellulose – which forms a membrane. Its best features are clear transparency, tear-resistance, odorlessness and it’s hygienic. Kalle & Co. AG (now GmbH, or Limited) still exists today and many of their earlier brand-names are registered still with the German Patent Office; Ozaphan is not anymore, but was registered from 1927 to 2007. The supposedly inexpensive motion picture film-material was derived from Cellophane and widely marketed by Agfa from 1930. It found its niche in the education sector and the home cinema market. 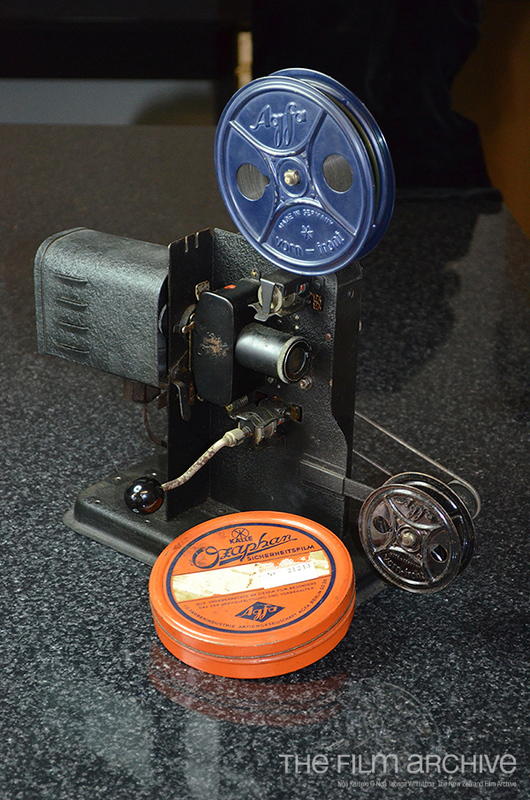 In Germany the commercial film industry (Agfa), film equipment manufacturers and the toy industry (movie projectors for children), collaborated and helped the development, production and popularity of Ozaphan. At the film lab a black and white master positive was contact printed onto the Ozaphan raw-stock, that way creating a latent (invisible) image by means of the said strong UV light. The tonal range of this master acted as filters with varying densities in every frame; darker areas allowed lesser or no light penetration and therefore lesser or no breakdown of diazonium salts, lighter areas allowed more or all to be broken down. As only unbroken or partly broken diazoinium was coupled and given a tone in development and fully broken became clear, the copy of the master positive became a positive. I have just mentioned the developing process that made it visible. I hope you got all that! The film’s sensitivity (or speed) was low and the picture quality was a little flat – almost muddy and grainy – which probably did not matter too much to the average home viewer, but as an attribute the material is regarded as fairly scratch resistant because the image is in the Cellophane rather than on the surface of a carrier (cell) like it is in conventional film, and that must have suited home cinema conditions. Unfortunately it did not suit mine! By the end of the 1930’s the Ozaphan system had grown very popular, with a number of Agfa, Plank and Ozaphan-branded movie projectors on the market. Available movie titles were published in the Hauptkatalog (main catalogue) using the slogan: “Neues und interessantes aus der weiten Welt” (New and interesting themes from the wide world). Prior to television, and with newsreels shown in halls and cinemas only, bringing “the world” to peoples’ living rooms proved a successful concept. WWII interrupted everything in Germany, including film production, but in the 1950s short films and shortened features were produced again. Production finally ended around 1960, when 8mm formats offered better value for money to the home market – and film in colour.